Usually the Russian President gives an Annual Speech to the Russian Federal Assembly in the first week of December but on this occasion the speech was delayed and set back to 1 March 2018, some seventeen days before the Presidential elections are set to take place. Current President Vladimir Putin is standing for re-election for the second and last time, and if he regains the presidency (as many expect him to do), then this March 2018 speech will serve as the mid-point of a remarkable period in which Russia transforms from a developing country, having suffered near total economic collapse, political corruption and social decay during the 1990s after some decades of stagnation, into a major global political power with a diversifying economy balanced among manufacturing, a renascent agriculture and mining, and a considerable potential to project soft power and influence in the form of a rich history and culture. Putin himself has overseen much of the country’s reconstruction since becoming President in early 2000 and staying at or close to the helm of the nation for the past 18 years. During this period there have been very many developments for better and for worse that have influenced the path Russia has taken in its reconstruction: on one side, there have been major technological achievements that promise to transform people’s lives (not necessarily always for the better) and communities; on another side, the rise of China as a major political and economic power opens up opportunities for the Russians and Chinese to work together to bring economic, political and social benefits to their peoples; on yet another side, Russia faces the enmity of nations in the West angered that their attempts to usurp Russian natural resources from the control of the Russian people in the 1990s have failed with the ascent of Putin to the Russian Presidency. Putin recognises the possibilities, opportunities and threats faced by Russia in his March 2018 speech: the first and larger half of his speech deals with domestic issues, and the challenges that these present to the government; the second half of his speech – and the half that has dumbfounded much of the world’s media – concentrates on Russian defence capabilities with an emphasis on new defensive technologies and weapons. Let’s look at the first half of Putin’s speech, that half that is focused on issues of concern to ordinary Russian citizens, as this is essentially dedicated to securing a foundation of stability for Russian families, communities and larger rural and urban settlements, and on which the nation’s future progress depends. Providing meaningful and well-paid work, improving and extending necessary infrastructure (including Internet-related technologies) in cities, towns and villages, building more houses and making them more affordable with the appropriate housing finance, improving healthcare, social services and education, committing to high standards of environmental safety and protection: these are all issues that the President referred to in some depth in his speech, enumerating achievements, pointing out deficiencies that could be worked upon and solved or improved, and setting out tough but attainable goals. In each topic, the President ranges from the very specific, focusing on particular problems and on targets, to the general. A nation with the ambitions Russia has needs a sound and stable investment environment and Putin spends considerable time detailing the desired economic structures and policies needed to grow the economy to the target levels. Encouraging the growth of small businesses, investing in new or upgraded technologies, increasing wages and offering better and more accessible financial resources are some policies the government will adopt. At the same time, Putin observed that the agricultural industry has undergone a renaissance (thanks partly to economic sanctions against Russia by the US and Europe) to the extent where Russia has brought in bumper wheat harvests two years in a row and is poised to become the leading global exporter of wheat. For agriculture and other industries to continue to develop, appropriate government institutions and networks are needed to supply the proper advice and assistance to small business owners and the self-employed. Such ambitions, goals and grand plans also need a secure environment to take root and thrive, and for much of the rest of his speech Putin focuses on the most recent advances in systems of Russian strategic defence weaponry, including nuclear-powered energy cells that can be inserted into missiles and unmanned submarine drones. Putin states that these advances and new systems are a response to the US decision to withdraw from the Anti-Ballistic Missile Treaty in 2000, which Russia had relied upon to stop the reckless deployment of nuclear weapons. While one suspects Putin very much enjoyed delivering this part of his presentation, like a child revelling in his toys, the President also took care to praise the scientists, engineers, designers and technical people who dedicated their energies and talents in creating, testing and developing these systems and weaponry. Putin concludes his presentation by reiterating that while Russia is ready and prepared to defend itself, the nation has resolved to follow its own path to prosperity and freedom, to respect and observe international law, and to work together with other nations to preserve global peace, stability and wealth. This is a very wide-ranging speech with much detail in its different parts with an emphasis on doing things, setting targets and striving to achieve them. Wherever possible the President emphasises collaboration and co-operation at all levels of work and hierarchy, and focuses on the unity of all individuals, groups, communities and institutions in working together. For a political speech, this presentation is visionary yet does not look or sound at all impractical or tries to bedazzle listeners with gee-whiz technical gadgetry that looks great on paper or a digital screen but morphs into a hugely expensive white elephant in reality. The humour – yes, there is humour! – is of the dry drop-dead kind: “… Friends, Russia already has such a [hypersonic] weapon …” to take one example. While people may wish that the ideological thrust of the President’s speech were more socialist / democratic, and the economic platform concentrating less on economic growth and concerned more with quality of life and environmental sustainability, the fact is that Putin is a pragmatic populist in his own way, who prefers to stick with the tried and true (in insisting on running a real economy as opposed to following the dictates of Wall Street and the demands of the global financial economy) and ends up a leader in much more than the strict political or economic sense – which is much more than can be said for the current generation of Western political leaders. As is his usual custom, Russian President Vladimir Putin delivered a speech at the final session of the annual Valdai International Discussion Club’s 13th meeting, held this year in Sochi, before an audience that included the President of Finland Tarja Halonen and former President of South Africa Thabo Mbeki. The theme for the 2016 meeting and its discussion forums was “The Future in Progress: Shaping the World of Tomorrow” which as Putin noted was very topical and relevant to current developments and trends in global politics, economic and social affairs. Putin noted that the previous year’s Valdai Club discussions centred around global problems and crises, in particular the ongoing wars in the Middle East, and this gave him the opportunity to summarise global political developments over the past half-century, beginning with the United States’ presumption of having won the Cold War and subsequently reshaping the international political, economic and social order to conform to its expectations based on neoliberal capitalist assumptions. To that end, the US and its allies across western Europe, North America and the western Pacific have co-operated in pressing economic and political restructuring including regime change in many parts of the world, in eastern Europe and the Balkans, in western Asia (particularly Afghanistan and Iraq) and in northern Africa (Libya). In achieving these goals, the West has either ignored at best or at worst exploited international political, military and economic structures, agencies and alliances to the detriment of these institutions’ reputations and credibility around the world. The West also has not hesitated to dredge and drum up imaginary threats to the security of the world, most notably the threat of Russian aggression and desire to recreate the Soviet Union on former Soviet territories and beyond, the supposed Russian meddling in the US Presidential elections, and Russian hacking and leaking of emails related to US Presidential candidate Hillary Rodham Clinton’s conduct as US Secretary of State from 2008 to 2012. After his observation of current world trends as they have developed since 1991, Putin queries what kind of future we face if political elites in Washington and elsewhere focus on non-existent problems and threats, or on problems of their own making, and ignore the very real issues and problems affecting ordinary people everywhere: issues of stability, security and sustainable economic development. The US alone has problems of police violence against minority groups, high levels of public and private debt measured in trillions of dollars, failing transport infrastructure across most states, massive unemployment that either goes undocumented and unreported or is deliberately under-reported, high prison incarceration rates and other problems and issues indicative of a highly dysfunctional society. In societies that are ostensibly liberal democracies where the public enjoys political freedoms, there is an ever-growing and vast gap between what people perceive as major problems needing solutions and the political establishment’s perceptions of what the problems are, and all too often the public view and the elite view are at polar opposites. The result is that when referenda and elections are held, predictions and assurances of victory one way or another are smashed by actual results showing public preference for the other or another way. Putin points out that the only way forward is for all countries to acknowledge and work together on the problems that challenge all humans today, the resolution of which should make the world more stable, more secure and more sustaining of human existence. Globalisation should not just benefit a small plutocratic elite but should be demonstrated in concrete ways to benefit all. Only by adhering to international law and legal arrangements, through the charter of the United Nations and its agencies, can all countries hope to achieve security and stability and realise a better future for their peoples. To this end, the sovereignty of Middle Eastern countries like Iraq, Syria and Yemen should be respected and the wars in those countries should be brought to an end, replaced by long-term plans and programs of economic and social reconstruction and development. Global economic development and progress that will reduce disparities between First World and Third World countries, eliminate notions of “winning” and “losing”, and end grinding poverty and the problems that go with it should be a major priority. Economic co-operation should be mutually beneficial for all parties that engage in it. Putin also briefly mentioned in passing the development of human potential and creativity, environmental protection and climate change, and global healthcare as important goals that all countries should strive for. While there’s not much in Putin’s speech that he hasn’t said before, what he says is typical of his worldview, the breadth and depth of his understanding of current world events (which very few Western politicians can match), and his preferred approach of nations working together on common problems and coming to solutions that benefit all and which don’t advantage one party’s interests to the detriment of others and their needs. Putin’s approach is a typically pragmatic and cautious one, neutral with regards to the political or economic ideology of whomever he deals with, but an approach focused on goals and results, and the best way and methods to achieve those goals. One interesting aspect of Putin’s speech comes near the end where he says that only a world with opportunities for everyone, with access to knowledge to all and many ways to realise creative potential, can be considered truly free. Putin’s understanding of freedom would appear to be very different from what the West (and Americans in particular) understand to be “freedom”, that is, being free of restraints on one’s behaviour. Putin’s understanding of freedom would be closer to what 20th-century British philosopher Isaiah Berlin would consider to be “positive freedom”, that is, self-mastery, with the implication that for people to have self-mastery, societies need to provide the conditions in which such people can exist and thrive. The most outstanding point in Putin’s speech, which unfortunately he does not elaborate on further, given the context of the venue, is the disconnect between the political establishment and the public in most developed countries, the role of the mass media industry in reducing or widening it, and the dangers that this disconnect poses to societies if it continues. If elites continue to pursue their own fantasies and lies, and neglect the needs of the public on whom they rely for support (yet abuse by diminishing their security through offshoring jobs, weakening and eliminating worker protection, privatising education, health and energy, and encouraging housing and other debt bubbles), the invisible bonds of society – what might collectively be called “the social contract” between the ruler and the ruled – will disintegrate and people may turn to violence or other extreme activities to get what they want. An English-language translation of Putin’s speech can be viewed at Paul Craig Roberts’ blog at this link. Compared to his speech at XI Meeting in 2014, this 2015 speech by Russian President Vladimir Putin isn’t quite as ground-breaking but it is full of fire nevertheless. In his speech, Putin spiked the United States government and its elites for following a path that has not only led to war and instability around the world, and continues to do so, but which has the potential to spread poverty, ignorance, distrust and a degraded culture as well, one that celebrates and encourages even more chaos and brutality. The theme of the XII Meeting was war and peace and Putin had plenty to say about the current global drive towards war, driven in the main by the United States and its allies. Starting from a general perspective on the role of war as a catalyst for relieving tensions and re-organising and establishing new political, social and economic hierarchies in the world, Putin observed how the threat of war diminished in the period after the end of World War II in 1945 – a period in which diplomacy under the threat of nuclear war prevailed – until the Cold War ended in 1991 with the fall of the Soviet Union. Since then, diplomacy as a tool for resolving long-simmering tensions and conflicts has increasingly fallen by the wayside and the use of force by the United States to achieve its aims in different parts of the world, especially in the Middle East, has come to be the first resort. Along with this flexing of military muscle and the chaos, violence and brutality that have followed, comes the creation of economic blocs, based on neo-liberal economic ideologies, between and among nations with the signing of treaties whose details and implications are deliberately hidden away from the public and never discussed or mentioned until long after the ink used to sign the documents has dried. At the same time, governments, corporations and the media actively seek to withhold and censor information, analysis and opinion that oppose the aims of their agendas; plus they use databases and database networks to gather and share information about citizens and their families for various purposes which can include blackmail, psychological manipulation, marketing and pushing products and services for profit. Constant wars against terrorists and terrorist movements – themselves the consequence of US-led invasions of countries (and in the case of ISIS, possibly the creation of the US government and its agencies, to serve as a substitute army keeping Middle Eastern countries weak and divided) – result in the displacement of people in those countries, leading them to flee in their thousands to Western countries, usually by any means available (no matter how hazardous and expensive), which are not only reluctant to offer safe haven to them but actively and aggressively throw them back into the seas or imprison them in detention centres where they face abuse, violence and death from fellow refugees or prison guards working under stress. The refugee crisis is used by Western governments to whip up hatred and prejudice against refugees, and to encourage and escalate public support for more invasions of the countries being destabilised to “stop” the refugee flow. Putin singled out the example of Syria where the process of regime change, starting in 2011 with the aim of ousting President Bashar al Assad, in ways similar to the Kiev Maidan revolution against President Viktor Yanukovych in Ukraine over 2013 and early 2014, is in full swing with takfiri fighters belonging to groups such as Islamic State, Jabhat al Nusra and other al Qa’ida offshoots, all funded and armed by foreign governments, fighting the Syrian Arab Army. Putin observed that such terrorist groups are hard to fight if they are being used as a de facto army to overthrow governments that, coincidentally, the US and its friends do not like. Putin went on to say that Russia launched a military operation in the form of airstrikes on the Islamic extremists at the request of the Syrian government. Russia understands that if the terrorists in Syria win, they will send many of their number to Russia itself, in particular into the vulnerable region of Daghestan and its surrounds. Putin emphasised that the world must support the revival of Syria and Iraq, and assist in their reconstruction and revitalisation of their institutions. A plan must be developed for these countries’ reconstruction, for the restoration of their infrastructures, their hospitals, housing and schools. This is an opportunity for all countries throughout the world to come together and offer assistance to these two long-suffering nations. What is most noteworthy about Putin’s speech at this point is its emphasis on the Syrian people as the major party in deciding Syria’s future and deserving respect, civil treatment and autonomy in the decisions they make about their institutions and future from the rest of the world. While the theme of the XII Meeting may have been war and peace, the theme of Putin’s speech is that for peace to reign, nations must co-operate together, respect one another and trust one another and in the rule of international law. This is very much a speech that follows from his speech at the XI Meeting in 2014. The fact that Putin ended his 2015 speech by speaking of renewal, restoration, hope and opportunity, and the hard work that must be done to achieve revival, demonstrates that he and his government are looking beyond helping Syria get rid of ISIS and other terrorists, and stabilising the country. An opportunity for Syria to become a model of reconstruction, renewal and reconciliation for the Middle East and the wider world is present and ready for the taking. How many Western politicians can be said to be as forward-looking as Putin? Given the way in which the US has blundered in the Middle East and north Africa over the past decade and how Germany brought chaos and confusion when it offered a haven to thousands of Syrian refugees stuck in Turkey, with no apparent thought for how to bring them over or how they would be settled, it seems that having a vision of the future and achieving it is something beyond Western leaders’ capabilities – to the detriment of the West. This essay is based on the English-language transcript of Putin’s speech at the Vineyard of the Saker blog. If like me, you suspected something odd about the official accounts of the shootings that took the lives of 12 people and injured 4 others at the offices of the magazine Charlie Hebdo in Paris in early January 2015 and you believe there’s far more behind the massacre that’s being withheld from the public, this essay by Stuart J Hooper ought to stir your interest. The article can be read at the 21st Century Wire website or you can listen to the audio transcript. Both prose and audio transcript go into considerable detail and range widely in examining the broad geopolitical context behind the killings so readers and listeners alike may need two or more excursions through the material to digest it all. The essay posits that the killings may be a false flag operation as defined by US commentator Dr Webster Griffin Tarpley in his book 9/11 Synthetic Terror: Made in USA. Tarpley’s definition of a false flag incident includes a setting in which unseen actors perform heinous acts and force patsies to bear responsibility for them under a privatised and controlled hidden command structure. The acts are reported by a controlled corporate media interested in currying favour with its owners and masters over proper investigation and analysis of the acts and reporting the truth to the public. What Tarpley might have added is that for such a setting with such actors and institutions to exist, a particular culture with certain political, economic and social conditions, values and belief systems exists that favours its development and continuation. Governments and corporations, be they private, public or in-between, feel no compulsion to be accountable to their publics and lying, opacity and disseminating propaganda are so widespread as to be a necessary part of living as breathing is. The people are trained to want to be lied to. Citizens are treated with contempt and as cyphers to be used and abused by governments and others with political, social and economic power. Hooper’s essay then examines what is known about the attacks to see if details about them suggest the attacks could be a false flag. The perpetrators were masked: because they were masked, their shouting of “Allahu akbar!” and that they had avenged the Prophet Mohammed don’t mean much in identifying them as radical Islamic extremists – anyone can shout such exclamations regardless of his/her faith, including you and I. What the utterances do though is to frame the attacks and push them into a particular narrative to be taken up and repeated by an unquestioning news media, and to be exploited by governments and corporations, sure in the knowledge that the public accepts the narrative, to advance their own agendas. All other alternative explanations about the perpetrators and their motives are shut out. The men on whom the killings are blamed appear to be patsies: what is known about Said and Cherif Kouachi’s backgrounds and histories suggests they lacked the ability, skills and experiece in planning and executing a professional hit on 16 people. The getaway driver turned out to be a teenage boy at school at the time of the murders. If the attacks had been done in such a way that none other than professional killers could have performed them, how could the killers be so remiss as to leave their passports behind in the getaway car? An explanation may be that leaving ID papers behind was part of the killers’ mission to frame the Kouachi men and the teenager in order to distract the police and throw them onto a wild goose chase after the patsies. The killers would then have time to escape, blend in with the French public and maybe even leave France. The fact that the Kouachi men had been tracked by the US, UK and French governments for years and that one of them was linked to al Qa’ida in Yemen and to Anwar al Awlaki, himself killed by a US drone in 2011, could suggest that these men were being used as assets by an unknown organisation with a command structure. Perhaps the most important part of the essay is its investigation of the prevailing geopolitical situation to find possible motives for the attacks to occur in France in the way they did at the time they did. A number of such motives exist: the French President François Hollande recently broke ranks with his fellow NATO leaders in a radio interview in stating that Russia did not want to annex eastern Ukraine, that economic sanctions against Russia had to stop and that France would not participate in unilateral military intervention in Libya. It so happens also that France is under pressure from Russia and from French ship-building unions to deliver two long-overdue Mistral warships to that country; the likely legal and financial consequences of non-delivery and the effect on France’s business reputation must be weighing heavily on Hollande. The insinuation is that the Hebdo attacks are a warning to France to follow the NATO narrative and agenda without question regardless of the impact on French national interests and the EU project. This suggests that a hidden command structure of the kind Tarpley’s definition of a false flag requires does exist. Some websites have raised as a possible motive the fact that in November 2014, the French lower house of parliament had voted in favour of supporting Palestinian statehood. This is more difficult to prove but there an eerie parallel could exist with Malaysia, which hosts a war crimes tribunal in Kuala Lumpur that convicted Israel guilty of genocide against Palestinians in November 2013; the following year, Malaysia Airlines lost two passenger jets in separate incidents, one of which (the shoot-down of MH-17 in Ukraine in July) appears very strongly to be a false flag incident as per Tarpley’s definition. Hooper’s article does quite a convincing job of making the case for the Hebdo attacks being a false flag, in tying up and reconciling various anomalies and contradictions in the details of the attacks. Subsequent developments after those attacks: the march of various world leaders in Paris to show solidarity favouring freedom of the press; terror raids in Belgium, France and Germany; cyber-attacks on 19,000 French websites; the increased police security around Jewish public places in France while Muslim communities suffered increased anti-Islamic attacks and discrimination but no extra police presence; Israel pressuring the French Jewish community to leave France for its own shores; and governments in various European states including the UK ramping up repressive measures – all insinuate that the Hebdo attacks have become an opportunity to shock and scare Europeans into accepting police state measures they otherwise would have decried, even demonstrated against. One could be forgiven for being paranoid and imagining that an unseen command structure or institution is indeed manipulating events and shepherding Europeans and others through fear, terror and uncertainty into a dark direction. This second part of my essay focuses on the Q&A session that followed Russian President Vladimir Putin’s speech at the Final Plenary Session of the XI Meeting of the Valdai International Discussion Club held in Sochi in late October 2014. Part 1 deals with the President’s speech and can be read elsewhere on this blog. Having finished his speech, Putin took a number of questions in a Q&A session from a number of people starting with questions by the British journalist Seumas Milne and (later in the session) Canadian political scientist Piotr Dutkiewicz on the issue of Crimea’s independence referendum, subsequent breakaway from Ukraine and reunification with Russia in early 2014. In answer to these questions, Putin patiently reiterated that Russia would seek conservative and proven solutions emphasising co-operation and mutual respect and that the country was not seeking to recreate an empire but will defend its own regional interests. He referred to the United Nations’ Charter – Part 2 of Article 1, to be precise – on the right of peoples to self-determination and to decide on their government without pressure from external others (even if these others are supposedly their legitimate rulers) with respect to the validity of Crimea’s independence referendum and compared the situation in Crimea with that of Kosovo in 1997. Nevertheless in reporting his chairing of the discussion and the Q&A session in an article for The Guardian newspaper, Milne inexplicably portrayed Putin’s answer to his question in such a way as to misrepresent what he said, omitting to mention that Putin had mentioned the UN Charter as the basis that justifies and validates the Crimean independence referendum, and which also justifies Putin’s comparison of both the Crimean and Kosovar referendums. In particular, Milne omitted to give the full context of the statement in which Putin admitted stationing Russian troops in Crimea “to block Ukrainian units”, implying that Russian soldiers prevented Ukrainian soldiers from guarding polling stations when in fact Russian soldiers were protecting polling stations from being invaded and voting disrupted by Ukrainian forces. The overall result of Milne’s omissions was to suggest that Putin and Russia had wilfully annexed Crimea and had been prepared to use force and violence to brazenly claim another nation’s sovereign territory on flimsy pretexts; in other words, Putin and Russia were acting as if a No Rules global regime were already in place, and Might Is Right is one of its guiding principles. Such biased reporting might be expected of other Guardian reporters like Shaun Walker but I had expected far better from Milne. As demonstrated by Milne and Dutkiewicz, a number of Western representatives in the Q&A session took for granted a particular point of view about Putin in which he behaves like a stereotypical autocratic dictator who has stashed several hundreds of millions of US dollars in bank accounts throughout the world and who conducts his foreign and domestic policies on the basis of self-interest, greed and expediency, and on that basis asked Putin rather slanted questions that seemed intended to rattle him and/or force him to contradict himself over points he made in his speech. Thus a media representative, Neil Buckley, asked Putin if he considered Ukraine to be a real and sovereign country and why there apparently were soldiers in Russian uniforms in Eastern Ukraine aka Novorossiya. To his credit, Putin not only patiently answered the questions (even though some were repeated but in a slightly different guise) but took the opportunity to explain something of Ukraine’s 20th-century history and how it became a hodge-podge nation of a number of ethnic and religious groups with nothing in common and even very different pre-1945 histories. He holds his own well against other speakers by being able to recall and quote details of issues discussed with little prompting. One of the more (though slightly) thoughtful questions came from Toby Trister Gati who wanted to know something about Russian-US relations and perhaps what Putin had in mind while criticising the US and its actions in the Middle East and in Ukraine: was he referring to the US President, the US political elite or American citizens generally. Putin seemed genuinely surprised that Gati did not know how the US is destabilising the Middle East by helping the terrorist organisation ISIS. The President kept coming back to the American insistence that it (the US) is always right and that it is an exceptional country bringing democracy to the benighted corners of the Earth. Another of the few intelligent questions batted to Putin was one by academic Robert Skidelsky who expressed concern over Russia’s reliance on energy exports and the country’s low levels of economic diversification. This gave Putin the opportunity to expound on the economic and financial reforms that have taken place since he first became President in 2000. An interesting question was posed by Nikolai Zlobin to Putin on whether Russia was making a great mistake by isolating itself from the rest of the world and in so doing, becoming more nationalistic and less democratic. Again this question reflects the prevalent viewpoint that Putin is re-establishing the Soviet Union in all its isolated and isolating ersatz glory in a Russian form. Putin’s reply was that Russia does not intend to shut itself off – it is the rest of the Western world, under pressure from the US, that is shunning Russia. In answer to Zlobin’s statement that Moscow has shut down various educational exchange programs, cut off certain non-political non-government organisations (NGOs) from Russian funding and clamped down on certain foreigners and dual citizenship, Putin pointed out that these programs, NGOs and the foreigners who had been asked to leave had been financed from abroad to carry out agendas that amounted to spreading propaganda of a subtle kind and portraying certain political and economic ideologies and philosophies as the only ones for Russia to follow. He also pointed out that the US has similar laws that prevent backdoor subversion of US culture and society through exchange programs and charities. To rub salt into a wound, Putin even took apart aspects of US political culture – such as indirect electi0n of the President by an electoral college, contrary to what most American voters themselves believe – and pointed out the hypocrisy of a nation that tells others what to do but does not practise what it preaches. Putin and Zlobin both discussed nationalism in its American and Russian contexts and came to agreement on its ability to unite people in a nation and at the same time cut them off from others and set countries onto paths of isolationism and distrust of others. In answer to a Chinese university academic on what he meant by “conservatism”, Putin assured him that he was referring to its original meaning of preserving the best of policies, attitudes, values and traditions that have stood Russia well over the decades, even centuries, and being open to everything new that is effective and worthwhile, and which helps Russia to advance and grow. Some people will recognise this as the kind of conservatism that used to exist in politics in the Anglosphere around the middle of the 20th century before it was distorted by Thatcherism / Reaganism and which is still represented by commentators like the American palaeo-conservative Pat Buchanan. The Q&A session was generally more noteworthy for what the questions say about the mind-sets of the people who asked them than what they were actually about. The questioners generally proceeded from an assumption that the US is basically good, that the current US government has lost its way and, if only it had better politicians who were less self-interested and more genuinely interested in advancing their country’s welfare and in cooperating with everyone else, then US President Barack Obama would fulfill his presumed role as a sort of Messiah who would eliminate all inequalities and discrimination, abolish poverty and wrongdoing, and lead his people into a New American Century, all shiny and glittering with gold. There is no consideration at all that perhaps the US government and its agencies are populated by rogue elements answering to a power other than the American people, and that the country’s institutions, values and belief systems are much to blame as they continue to attract the most psychopathic personalities into the upper political, economic and social echelons. Clearly Putin operates on a different planet than many of the people who quizzed him. Thus there was a certain amount of repetition in some of the questions and an obsession with the situation in Ukraine and Crimea, suggesting that the people asking the questions couldn’t believe what they were hearing from Putin and trying to grill him until he came up with the answers they were expecting. On that note, I conclude that the Q&A session was not in itself as highly informative and illuminating about Putin’s speech as it could have been, apart from Putin’s replies to Professor Feng Shaolei about conservatism and to Nikolai Zlobin about Russia’s relations with the rest of the world. Founded in 2004, the Valdai International Discussion Club brings together experts ranging from politicians to economists, public servants, journalists and academics from around the world to analyse and debate on Russia’s role and position in the world. The first meeting was held in Veliky Novgorod near Lake Valdai, hence the name of the club. The goal is to promote dialogue and debate on political, economic, social and other major issues and events of importance both to Russia and the rest of the world. In 2014 the eleventh meeting was held in Sochi and it was here that Russian President Vladimir Putin delivered a speech in the final plenary session of the meeting (as is his custom) that in the future is likely to be seen as signifying a major turning point in geopolitical history. Under the theme of New Rules or a Game Without Rules, Putin declared that Russia will no longer participate in international politics according to rules set by the United States and its allies but will forge its own path as a regional power in its neighbourhood, as determined by the will of the Russian people, pursuing the path of peace and economic development and avoiding war where possible unless threatened by others. By making this statement, Putin has put Russia on a path the country has never trod before – previously Russia in various manifestations has either copied and followed other (usually Western) countries or has cast itself in a messianic role, whether as successor to the Byzantine empire, leader of the Slav nations or leader of the Communist world – and by doing so, has perhaps shown the rest of the world that there is an alternative to the tired Cold War paradigm that posed one set of countries and ideologies against another set of countries and ideologies, and both sets having long outlived their usefulness and relevance to a world beset by ominous developments that transcend political, economic and social divisions. Putin noted that current geopolitical institutions, systems and law mechanisms have become weak, distorted and ineffective against a rising tide of violence, instability and brutality in many parts of the world, in particular in parts of the Middle East and in Ukraine. Increasingly countries, Russia included, are searching for ways that will lessen their dependence on the use of the US dollar in trade and are establishing alternative financial and payments systems that do away with the US dollar as the reserve currency. The use of sanctions against Russia and other countries like Iran are undermining trade and causing economic stress in EU countries in spite of the fact that these countries have initiated sanctions under pressure from the US. Putin also referred to the 2013 banking crisis in Cyprus, in which that country’s government attempted to seize monies from uninsured savings accounts in major Cyprus banks as part of a bail-out agreement struck with finance ministers of Eurozone countries with the blessings of the EU and the IMF, as a motivator to seek out alternatives to the current global financial system that help preserve political and economic sovereignty. From Putin’s point of view, much of the blame for the breakdown in the systems and mechanisms that maintain world peace and stability lies with the United States which, since the early 1990s with the end of the Cold War, has broken its promise made to Russia by then US Secretary of State James Baker that the US would not extend NATO membership to former Warsaw Pact nations, and has sought and instigated regime change in several countries in western Asia and northern Africa as outlined in the Project for the New American Century, authored in part by neoconservative historian Robert Kagan whose wife Victoria Nuland is the current Assistant US State Secretary to John Kerry. Regarding itself as the winner of the Cold War, the US and its allies have tried to impose their own narrowly interpreted and highly militarised solutions onto major world and regional problems and conflicts: solutions that have the effect of throwing gasoline onto fires to put them out. Putin referred to US-led overthrows of governments in Iraq and Libya, and the current US attempt to unseat Bashar al Assad’s government in Syria, with all the dire consequences that have followed and resulted in hundreds of thousands of casualties and millions of refugees, and large-scale environmental catastrophe that surely must influence global climate change, as examples of such hubris on the part of the Americans. Having surveyed the sorry state of the world thus far, Putin comes to the question of whether to live by New Rules or No Rules. He explicitly rejects the No Rules option because the current global situation is clearly on the path to No Rules. He reminds his audience that nations must agree on fundamental values and to co-operate in finding collective solutions to common problems and issues. Major participants in such co-operation must lead the way in behaving with self-restraint and in ethical and responsible ways that others will be happy to follow. International co-operation and relations should be based on international laws that are themselves based on moral principles and respect by nations for one another and their interests. Within this world of New Rules, Putin places Russia decisively on a path in which the country will emphasise pursuing its own development with an emphasis on open, democratic and accountable political and economic institutions, selectively adopting those modern global trends that would enhance the country’s progress and strengthen its society by emphasising traditional values that have stood the country well in times of crisis. Russia will look back into its history, forward into a likely future and around it to find and draw upon those resources and forces that will ensure and enhance its progress. Putin explicitly rejects the idea of Russia becoming an empire again and envisages the country as being a partner willing to work with others on the basis of mutual interest and respect. 7. Russia does not want the onset of chaos, not seeking war and it is not going to start first. Nevertheless, today Russia is considering the prospect of a global war almost as inevitable, is ready for this and continues to prepare.Russia does not want war, but not afraid. Having finished his speech, Putin took a number of questions in a Q&A session from a number of people including questions by the British journalist Seumas Milne and Canadian political scientist Piotr Dutkiewicz on the issue of Crimea’s independence referendum, subsequent breakaway from Ukraine and reunification with Russia in early 2014. In answer to these questions, Putin patiently reiterated that Russia would seek conservative and proven solutions emphasising co-operation and mutual respect and that the country was not seeking to recreate an empire but will defend its own regional interests. He referred to the United Nations’ Charter – Part 2 of Article 1, to be precise – on the right of peoples to self-determination and to decide on their government without pressure from external others (even if these others are supposedly their legitimate rulers) with respect to the validity of Crimea’s independence referendum and compared the situation in Crimea with that of Kosovo in 1997. The rest of the Q&A session will be covered in Part 2 of this essay. That Russia seems content to be only a regional power in its sphere of influence may disappoint those people who want to see a new world power leading a coalition of nations pulverise the United States and its allies. But such a scenario would be a repeat of old Cold War fantasies and would certainly play into the US government’s own desires of provoking Russia into war. From the experience of the Soviet Union in Afghanistan, Russia is well aware of the pitfalls of travelling down that path again and how among other things the arms build-up and race against the US which the war in Afghanistan entailed weakened the USSR and distorted its economic decision-making and priorities. Also there would be no guarantee that a rerun of the Cold War would not come to corrupt Russia’s decision-makers and its economic elites in the way the Cold War corrupted the US the first time. The Russian strategy means that the US and its fellow head-bangers will continue to bash themselves silly (and waste taxpayers’ money) with trying to stir up conflict in Ukraine, the Middle East and other arenas, only to see these conflicts fizzle out to their own disadvantage. It might seem extraordinary that for the first time since 1945 a major power is content to remain within its own region and not take active steps to ensure that peace and stability in places beyond its immediate neighbourhood endure. This scenario is one that might strike Americans who know their country’s history well as being similar to the isolationist policy that the US tried to follow after World War I, to the extent of spurning membership of the League of Nations. The fact that the most powerful nation in the world in the 1920s and 30s turned its back on the rest of the world may have encouraged countries like Germany, Italy and Japan to pursue their ambitions and embark on empire-building; if the US did not support the League, then those other countries also would not support it. Isolationism as a nation’s foreign policy then failed to prevent instability and the drift towards another major world war. But this is not to suggest that Russia will follow isolationism in the same way that the US did; Russia may very well follow a selective isolationism in which the country will concern itself mostly with issues in the Eurasian region but will retain membership of the UN or its successor organisation, and might intervene in situations far beyond Eurasia if requested to do so as a third party mediator perhaps under UN or similar auspices. What I think is most likely at this point is that Russia will refuse to be at the beck and call of every insecure small nation or group of such nations (like, say, the so-called Baltic nations Estonia, Latvia and Lithuania; or the Vyšehrad nations Poland, the Czech Republic, Slovakia and Hungary) to intervene militarily in every problem that these countries perceive as threatening to them (whether they actually are or not) and to turn its armed forces into a mercenary global police force for hire, as the US has done over the past 60+ years. Whether in the long run that turns out to be a good thing or not, or the right path or not, we cannot judge from our vantage point in which most major global issues and conflicts have become extremely polarised politically. What Putin has done is to signal the end of an age in which ideology and abstract concepts determine inter-relationships among nations and whether some nations should be judged “good” and others “bad” by selectively applied criteria from particular mishmashes of ideologies held by dominant partners. Instead his speech heralds an age in which nations greet one another at face value and co-operate as partners on pressing global issues, finding common cause and working together on agreed principles to resolve problems. It is time to approach and tackle problems as they are on their own merits and to find the most appropriate solutions based on the nature of the problem and the context at hand, and whether they will benefit most of those people who might be affected by the problem, not on whether it adheres to a narrowly interpreted abstract ideal. Pragmatism and policies based on fairness, justice and accountability should govern nations’ relationships with one another. Disappointingly but not surprisingly, Putin’s speech was either not broadcast on mainstream news media in the Anglosphere or was cherry-picked over for comments he made that would back the Western propaganda narrative of Putin as a dictator and tyrant whose removal from the global scene is now due. Anyone reading who has not yet viewed the speech can watch it on Youtube by clicking this link; the Q&A session follows as well. An English-language transcript of the entire session can be read here. Almost a year has passed since November 2013 when the former Ukrainian President Viktor Yanukovych decided to postpone signing the EU-Ukraine Association Agreement, to which decision individuals and groups favouring closer EU and Ukrainian political and economic ties (with a view to Ukraine gaining full EU membership and a visa-free travel regime allowing more or less unrestricted travel through other EU member countries) began assembling on Independence Square (the English translation of the Ukrainian name Maidan Nezalezhnosti – from here on, the square will be referred to as the Maidan) in the capital Kyiv to protest and call for European-Ukrainian integration and Yanukovych’s resignation. Demonstrations and protests escalated on the Maidan and culminated in the shooting of Berkut police and demonstrators alike by unknown snipers on the night of 21 February 2014. Yanukovych and several other government officials fled Ukraine and the Ukrainian parliament impeached Yanukovych’s government and replaced it with a temporary one led by Oleksandr Turchynov, the Speaker of the parliament (Verkhovna Rada), and Prime Minister Arseni Yatseniuk. A number of new laws passed by the interim government antagonised the ethnic Russian-speaking minority in eastern and southern parts of Ukraine (and smaller groups of Hungarians and Czechs in far western parts). In March 2014, the Autonomous Republic of Crimea and Sevastopol held a referendum, deemed illegitimate by Kyiv and the wider world, in which voters overwhelmingly voted for accession to Russia. Russia responded to the referendum result and admitted Crimea and Sevastopol to the Russian Federation on 18 March 2014. Inspired by Crimea and Sevastopol’s actions, the eastern Ukrainian oblasts of Donetsk and Luhansk also tried to break away from Kyiv’s control by declaring themselves People’s Republics in April and holding their own independence referendums in mid-May. The response of Kyiv to Donetsk and Luhansk’s actions was to instigate military action against breakaway oblasts in April. Since then, the Ukrainian military has thrown tens of thousands of soldiers against small militias of determined pro-Russian separatist rebels; in the fighting, hundreds if not thousands of Ukrainian soldiers have either gone missing, defected to Russia or died. The actions of the Ukrainian armed forces, starved since Ukrainian independence in 1991 of adequate funding for salaries, training and upgraded facilities and equipment, have been marked by incompetent leadership and management, and possibly bad military strategy. What has now become a major political and existential problem for Ukraine, on which the country’s whole future as one entity depends, originally was an issue of deciding the country’s economic future so as to resolve its many and quite dire economic problems. What was the state of Ukraine’s economy when on that fateful day in November, Yanukovych nearly put pen to the dotted line on the paper? A general survey of Ukraine’s economy as of 2013, more or less, is in order as a foundation for us to get a grasp of issues involved. On achieving independence in 1991, Ukraine inherited a centralised economy in which government planning was dominant from the Soviet Union and in which mining, heavy industry and agriculture were the main sectors. The country had a highly education labour force and a good education system that emphasised the acquisition of technical and scientific skills. However from the mid-1960s up until independence, industrial growth and development slowed and stagnated due in part to lack of effective economic leadership at national and regional levels as the Soviet political elite aged. The system was also corrupt in the way economic plans and goals were set by government bureaucrats and the way goals and output figures were fudged by those charged with production, and leading that production, resulting in ever more corruption (since the false figures were used as inputs for the next annual or 5-year plans) which must have reached surreal proportions in some industries. For most of the 1990s, Ukraine’s economy languished in a deep recession marked also by hyper-inflation and the country’s gross domestic product (GDP) shrank alarmingly as the country’s leaders struggled ineptly to change its orientation from a centrally planned economy to a market-run economy with private enterprise. Industrial, agricultural and other enterprises that hitherto not only employed and paid workers to work but also managed some aspects of their leisure and health had to adjust to a new ideology and work culture and organisation in which maximisation of profit was the chief goal. After 1999, Ukraine’s GDP began to grow and to continue growing in fits and starts at least until the Global Financial Crisis of 2008 when the economy shrank again. In 2010 the economy began to grow again but stalled in 2012 and 2013. 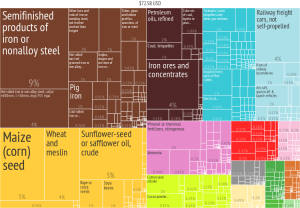 In 2012, Ukraine’s GDP (Gross Domestic Product which measures the market value of all final output including services produced by a nation in a calendar year) was US$176.3 million, putting the country on par with Vietnam and Romania, and lower than Egypt, Kazakhstan, Peru and the Philippines. As of 2013, Ukraine depended in the main on mining (based mainly in the south-central and the eastern parts of the country), heavy industry and manufacturing (concentrated around Kyiv and in the east) and agriculture. The Donetsk region contains large reserves of coal and Kryvy Rih has iron ore reserves. Other mineral resources in the country include manganese, bauxite, nickel, titanium (Ukraine has the world’s largest supply) and salt. As of 2012, metals accounted for about 40% of the country’s exports. There is some production of crude oil and natural gas but not enough to supply the country’s own industrial and domestic needs. Ukraine is highly dependent on Russia for its oil and gas needs. Until June 2014, Ukraine had been receiving a 30% discount on imported gas from Russia; the discount was discontinued by the supplier Gazprom as Ukraine had an outstanding debt of $4.5 billion. Ukraine is now required to pay upfront for Russian gas. There have been ongoing disputes between Ukraine and Russia over gas supplies and gas supply negotiations and treaties, especially over price and supply issues and the linking of gas supplies with Russia’s leases of naval ports in Crimea (when the peninsula was still part of Ukraine). Ukraine’s geographic position between Russia and much of Europe makes the country a corridor for natural gas and oil to pass from Russia and the Caspian Sea region to the European Union. There have been issues with the amounts of gas passing from Russia through Ukraine to Europe which leads this writer to believe that private companies in Ukraine, a number of which are owned by oligarch politicians, regularly siphon off gas in secret and store and use it in ways that profit the companies and their owners. Almost two-thirds of Ukraine is made up of fertile chernozem (black earth) soils in the central and southern areas, and agriculture plays a large role in economic output and as an employer of labour. The country produces wheat, potatoes, sugar beets (it is the world’s largest producer), barley, maize, rye, cabbage, tomatoes and sunflower seeds, and its livestock includes pigs, cattle, goats, sheep and poultry. Beekeeping is a significant industry and Ukraine produces more honey per person than any other country in the world. During the Soviet period, Ukraine produced up to 25% of the union’s entire agricultural output, mainly in cereals, and was known as the bread basket of Europe. After 1991 though, agricultural production declined as a result of declining government and other investment in necessary capital such as tractors and combine harvesters, fertilisers and pesticides. Privatisation of agricultural land began in August 1995 and by 1996 over half the arable land being worked was in private or collective hands. As of 2012, agriculture employed 16.8% of the workforce and Ukraine was the world’s sixth largest exporter of grain. The sector still needs investment if it is to increase production and harvests. Industrial production includes iron and steel-making, mineral fertilisers, sulfuric acid, transport vehicles including passenger vehicles, aircraft including hang-gliders and para-gliders, ship-building and aerospace vehicles. Consumer goods that are an extension of iron and steel manufacture (in many countries, the same companies that make iron and steel also produce items that incorporate iron and steel) which are made in Ukraine include refrigerators and washing-machines. As of 2012, steel accounted for about 40% of total exports and manufacturing made up 14.6% of the country’s GDP and employed 13% of the Ukrainian workforce. Ukraine has a well-developed IT sector – in part a legacy of the Soviet period during which aircraft, transport vehicle and aerospace manufacturing were developed, requiring technical and engineering knowledge and education – spread across the country with most firms concentrated in and around Kyiv and Kharkiv in the east: according to the Wikipedia article on the Ukrainian economy, the country had the fourth largest number of certified IT professionals in the world in 2013 after the US, India and Russia. In 2013, the value of the IT outsourcing industry in Ukraine was US$2 billion. Access to the Internet in Ukraine is good, particularly in the cities, and Ukraine has one of the highest Internet access speeds in the world. Broadband services and WiFi hot-spots are available in cities and mobile data services are available in urban areas, airports, roads, railways and coastal waters.Online retail, ticketing and banking services are available and Ukraine is one of the fastest growing E-commerce markets in Europe. The popularity of online retail and trading might suggest it compensates in part for deficiencies in other sectors of Ukraine’s economy in the same way that in some Third World countries, mobile phone usage compensates for the lack of traditional telephone landline networks. The country’s largest Internet access provider, Ukrtelecom is owned by an Austrian investment company. The country’s transport infrastructure is run-down and imposes a number of costs on the economy in terms of safety, quality, fuel usage and environmental impact. Bad roads mean longer journey times for cars and trucks (translating into more petrol use if certain roads have to be closed and vehicles need to find alternative routes) and more accidents which themselves impose a burden on medical and social services, and the infrastructure that supports these. Companies absorb the transport costs by passing them on to their customers who in turn pass these and other transport costs they accumulate on to their customers, and so on all the way down to the end users: the general public. In this way, everyone ends up paying the price for an inefficient transport network. Even so, the network is adequate for Ukraine’s basic economic needs – its problem is that it needs upgrading and for that, capital investment is required. Railway stock in particular needs to be modernised. According to Wikipedia, Ukraine is the 8th most popular destination in Europe for tourists, and tourism accounted for 2.2% of the country’s GDP in 2012 and employed 1.7% of the workforce in the same period. Tourists are classified as shopping tourists (mainly from neighbouring countries where prices are higher than what they are in Ukraine for the same items), dental tourists (those tourists seeking dental care that is cheaper than in their home countries), and classic recreational / sightseeing tourists. The banking industry is overseen by the National Bank of Ukraine and consists of over 180 banks, both state-run and private. Large local private banks include PrivatBank, the largest commercial bank in the country, owned by oligarch-politician Ihor Kolomoisky; Imexbank, owned by Leonid Klimov; and System Capital Management Holdings, owned by Rinat Akhmetov, another oligarch-politician. A number of foreign banks including Sberbank (Russia), Prominvestbank (Russia), PravexBank (owned by Intesa Sanpaolo Group in Italy) and BNP Paribas (France) also have offices in the country. Most Ukrainians have become poor since 1991 and there are many social problems such as alcoholism and AIDS. The poverty and social stresses are reflected in life expectancy which decreased during the 1990s. Infant mortality rates increased during the same period. Infrastructure such as roads and utilities are in a poor state; the water supply and its quality in the country are a major concern and diseases such as cholera, typhoid, dysentery and hepatitis are present. The fact that a number of major commercial banks (plus other enterprises in other industries) are owned by wealthy politicians either directly or indirectly poses not just a conflict of interest for the country’s governing elite but also a threat to good governance, financial transparency and accountability, and ultimately Ukraine’s long-term development potential as local and foreign investors will view the country as hopelessly corrupt. This affects all other sectors of the Ukrainian economy: if Ukrainian business practice and government enforcement of laws that regulate business and finance are seen to be compromised because of the extreme concentration of business ownership and wealth in the hands of a few who also happen to dominate the country’s politics, much-needed foreign investment will avoid the country altogether and all major sectors of Ukraine’s economy will shrink and starve for lack of capital. In a country that is virtually a plutocracy, the efficient collection of taxes may well be a pipe-dream and the taxation laws a laughing-stock: if the rich who pull the purse-strings as well as the puppet-strings don’t pay their share of tax or resort to tax evasion and don’t care that others will notice, ordinary people will follow their example. Essential services and infrastructure that rely heavily on taxation revenue for funding end up undeveloped and run-down, and become ripe for privatisation (which may have been the original intention all along). There’s the possibility that in some parts of the country, wealthy oligarch-politicians may spend money on services that would normally be funded by government at national, regional or local level but this means that the people who benefit from this are basically bought by their benefactor and eventually owe him (maybe her) protection money or its equivalent. It’s true that manufacturing in Ukraine does suffer from inefficiencies which make it uncompetitive with Western manufactures; in the early 1990s, such inefficiencies could be blamed on the country’s inheritance of centralised state planning which by its nature of top-down decision-making was slow to respond to consumer and enterprise demands. However other European countries that were formerly part of the Soviet orbit, and which gained independence only a couple of years before or the same time as Ukraine, have passed through their baptism of fire faster and successfully as well, though they continue to struggle with problems arising from their transition to market economies. The issue is that in adjusting to market economics and in becoming a market economy, Ukraine was compelled to undergo the kind of neoliberal economic shock treatment (yes, I have read the Naomi Klein book “The Shock Doctrine”) that other countries like Poland and Russia had to swallow. The kind of steady transition that a Sweden or a France could afford was not an option offered to Ukraine by a West enamoured of Thatcher-Reaganite economic policies. While many eastern European countries were able to transition successfully to market economies thanks to historic links with Germany or Sweden (which meant that German and Swedish companies invested in those countries and passed on aspects of their corporate, managerial and industrial cultures), Ukraine did not have that kind of luck due in part to its peculiar origin as a patchwork nation of peoples with different cultures, religions and histories. Western Ukraine looks to the West because of its historic links to the Poland-Lithuanian Comonwealth and the Austro-Hungarian empire and Eastern Ukraine looks to Russia due to long-standing historical and ethnic links with that country. In addition, the political elites who have governed Ukraine since 1991 have often proven incompetent, corrupt, arrogant and self-serving. The country has significant environmental issues including industrial pollution and radiation issues that are a legacy of the 1986 Chernobyl nuclear reactor explosion which released a huge cloud of radioactive particles that drifted as far north as Finland in the immediate aftermath and contaminated soils in and around the town of Chernobyl itself. From the foregoing, we can see there is tremendous potential for Ukraine to regain its role as bread basket for Russia, much of eastern and central Europe, and even beyond; the main thing holding back the country is its political leadership which seems to be in a permanent state of crisis and chaos. This has many deep consequences that affect the country in many ways: lack of clear political and economic goals translates into lack of investor confidence in the country’s leadership which itself means desperately needed local and foreign investment is lacking. As a result, several economic sectors, all of which depend on one another, suffer stymied development. An efficient transport network is needed to transport agricultural and industrial output and the machinery and other capital needed by the relevant sectors to produce goods. It has to be said also that cronyism is rife and is probably Ukraine’s biggest political and economic problem. While President Viktor Yanukovych (2010 – 2014) was associated with cronyism in the Western news media, other politicians in Ukraine – former Prime Minister Yulia Tymoshenko and PrivatBank owner Ihor Kolomoisky come to mind – are equally, if not more so, up to their eyeballs and beyond in corruption. Kolomoisky in particular is an unsavoury character who does not hesitate to use armed thugs in launching takeovers of companies he takes a shine to. Tymoshenko spent time in the slammer for acting without authority from the Ukrainian government as Prime Minister in negotiating a gas deal with Russia in 2009. With the overthrow of Yanukovych in February 2014 and his government’s replacement by one led by Turchynov and Yatseniuk until mid-May of the same, when presidential elections brought Petro Poroshenko, owner of a major confectionery business, to power, the crony capitalist order seems set to continue. As of this time of writing, Poroshenko still has not divested himself of his interests in the confectionery business despite pledging during his election campaign that he would do so. As Ukraine slides deeper into all-out civil war that began in April 2014, the transformation from bread basket to basket case is almost complete. WHAT’S TO BE DONE WITH CHECHNYA? After the Boston Marathon bombings in April 2013, and the arrest of suspect bomber Dzhokhar Tsarnaev – a young Chechen resident in the US, whose older brother Timurlan was suspected as his co-conspirator but who died in suspicious circumstances during the police investigation and search – the global spotlight has fallen on Chechnya, a semi-autonomous republic in the Caucasus region in southern European Russia, as a site of political instability and terrorist activity. Since the fall of the Soviet Union in 1991, the region’s fortunes have waned under the leadership of various Prime Ministers and Presidents including Dzhokhar Dudayev and Aslan Maskhadov, and two brutal wars waged by Russian President Boris Yeltsin against Chechnya during the late 1990s; and then waxed after the installation of Ramzan Kadyrov as head of the Chechen Republic by Yeltsin’s sober successor Vladimir Putin in 2004. Nearly ten years since Kadyrov’s rise to power have passed, and what’s the situation in Chechnya now? It’s subsidised by the Russian government, but a recent audit of Chechnya’s budget implementation by the Accounts Chamber of the Russian Federation has revealed apparent discrepancies and violations to the tune of 7.9 billion rubles. Until recently, unemployment was high  and it was only in 2012 that the unemployment rate fell below 30% ; this was one result of a state program for Chechnya’s social and economic development from 2008 to 2012. Social and economic stability still seems low, though, and many young Chechen men have either drifted into or been enticed to join extremist Islamic groups funded from outside Chechnya and Russia; there are many mercenaries fighting in Syria who are Chechen. – the banking system remains undeveloped and money laundering is a major issue. Although Šmíd’s article didn’t draw many connections among these issues, I get an impression from it that the Kadyrov administration appears uninformed as to how to build up a society based on industry and which invests in its people as Chechnya’s most important resource. Funds are being used for vanity projects to impress Russian Federation officials and foreigners while the bulk of the population goes without consistent quality education and health care. This echoes what Third World countries in parts of Africa and Asia did when they first became independent in the 1960s: they spent money, much of it borrowed, on building dams, swanky hotels and, in one African Muslim-majority country, the world’s largest Roman Catholic cathedral . At the end of the day, what these countries had to show for their efforts were a lot of expensive concrete white elephants that often ended up being eroded by tropical rains and swallowed by jungle, plus a humongous debt that citizens had to pay for by having to surrender what meagre public education and health care services they had to fulfill IMF and World Bank demands that their governments pay off outstanding loans first and think of their citizens second (or last). Chechnya is travelling down this well-worn path of expensive flashy Potemkin village structures (that might not actually be very well constructed) and a massive debt that its people will eventually have to shoulder. What can be done to wean the Kadyrov administration away from preferring show-pony projects over the hard work of growing a stable and diversified economy with a healthy and educated workforce that’s as keen on culture, sport, art and science as in working hard and earning enough to invest in their families and children’s well-being? Some of the problems Šmíd identified may be a consequence of the structure of Kadyrov’s government: he says it is “strongly vertical” which I take to mean that it’s pretty much one-man rule. Kadyrov would be carrying primary responsibility for determining what to spend money on and how much to spend. Who’s advising him and what sort of advice he’s getting are crucial: is he relying on experts advising him what to do or is he taking notes from relatives, friends, friends of friends and the “counsel” they recommend? A stereotype about Chechens and Chechen society is that the people are much the same as the Mafia and the society is dominated by tribalist-minded clans who close ranks and command absolute obedience from their members whenever something they don’t like wafts by, and wage blood feuds and vendettas against one another. True, Chechen society traditionally was dominated by tribal institutions called teips , made up of clans of related members who would band together to exact revenge on outsiders who committed wrongs against one of their own; but Chechen society also had a code of ethics (konakhallah)  aimed at spiritual and moral perfection of the individual regardless of social class, ancestry and teip affiliation , and which at times must have contradicted a person’s loyalty to his/her teip. For every stereotype about Chechens that is based on fact, there can be a surprising counterpoint in Chechen culture and society. Whatever, the issue of why Kadyrov is spending money on concreting over the country needs tackling. If he is spending money in particular areas as a way of appeasing and balancing rival groups’ interests, that may indicate a weak civil society in which legal institutions are poorly developed. In such a context, bribery and other forms of corruption are bound to flourish. Without a proper legal set-up that makes court mediation and settlement of disputes with proper compensation possible and available to everyone, people end up resorting to haggling, underhand methods and appealing to clan and teip heads who in their turn might demand absolute loyalty from the appellants. In the early 2000s, Grozny had a Supreme Court and the towns had district courts, and correctional facilities also existed . More might need to be done that addresses the particular legal needs of Chechens: a system of mobile lawyers to reach remote settlements to hear and settle disputes might be what they want. Communities would be expected to pay for these lawyers’ protection and accommodation costs; the Chechen code of conduct (nokhchallah) could be invoked to give immunity to the lawyers from harassment and threats of violence. Heads of communities would have responsibility to guarantee this immunity. A code of law that blends Russian legal codes with aspects of Islamic law and native Chechen law and traditions might also be what Chechens want. Ideally experts in Islamic law and native Chechen law within and outside Chechnya would work with Russian and Russian-trained Chechen legal experts in creating such a code. The code must ultimately respect human dignity and ensure legal equality for everyone, and conform to international conventions signed by Russia. If Kadyrov is spending to bolster his and his family’s fortunes and acquire more power and influence, government structural reform might be required so that power is less concentrated in his position and dispersed in a more horizontal structure. The Chechen State Assembly needs to become a more effective legislative political institution that represents the interests of the Chechen people. Political parties that are not Moscow-based but based on Chechen people’s needs and interests are needed. Šmíd also identifies a weakly developed banking and financial system which allows corruption and money laundering to fester. Not surprisingly, any external investors currently thinking of investing in Chechnya would take one look and run off. It goes without saying that some of those prospective investors represent the very industries that Chechnya needs: petroleum companies to open up Chechnya’s oil resources, medical and health care firms, and educational and cultural agencies. Perhaps one reason the banking and investment sector is so badly lacking is that the government is suspicious of Western investors who would take advantage of Chechnya’s relative naivete about the financial world to claim the country’s assets for themselves in the name of “privatisation”. One possible solution would be for the Kadyrov administration to adopt Islamic banking  as the basis for Chechen banks and require all such agencies and other financial institutions to conform to Islamic banking principles that prohibit usury and other forms of financial exploitation. The definition of financial exploitation could be extended to include bribes, financial blackmail, kickbacks, transactions and financial products that involve several layers of buyers and sellers based in locations outside Chechnya or the Russian Federation, and transactions whose paper trails are imprecise and can’t be traced easily. A team of experts from within Russia and countries where Islamic banking has been practised for some time could advise on the best ways to set up and develop banks and other financial institutions suited to Chechen people’s needs. Chechens themselves need training and education on how to run these banks and run them well. Without strong and accountable political, civic and financial institutions to provide a bedrock, issues of perennial budgetary black holes, corruption in high places, favouritism towards political allies and misallocation of funds towards pet projects instead of more pressing needs such as education, health care, social welfare, a proper transport infrastructure, law and order, and creation of a context that attracts private business investment to stimulate industry that provides gainful employment, will continue. I have come across some online news that suggest that construction projects in Grozny have exploited workers who were forced to work at low wages in near-slavery conditions. Laws that forbid exploitation of workers and establish their rights are needed; a court that oversees industrial working conditions and collective bargaining and negotiating between employers and workers might be needed. The use of subsidies to encourage construction and employment can only continue as long as Russia’s economy is thriving. If the situation changes, Russia would find itself in a position of propping up Chechnya and similar dependent regions that become a drain on the rest of the country, similar to Yugoslavia in the 1980s when richer areas like Croatia and Slovenia subsidised poorer regions like Kosovo. Russian taxpayers are already expressing their distaste at having to support what they see as freeloaders. For its part, the Kadyrov administration may be dependent on yearly hand-outs. However, withdrawing subsidies from Chechnya has its dangers: Kadyrov might need the subsidies as much to balance competing pressures from rival groups in the Chechen political elite; his position would become tenuous if the money spigot were turned off; and if he perceives that Russia no longer supports him, he may look to other countries in his part of the world (Turkey, Saudi Arabia, Qatar) to make up any shortfalls in funding. This would open the door to Saudi and Qatari-financed groups wanting to convert young Chechens to extremist forms of Islam and turn them into jihadis. There may well be the attitude on the Chechen elite’s part that Russia owes Chechnya big time for ruining the republic during the wars of the 1990s; if Russia were to switch off the supply of funds, the Chechen leadership may turn against the Kremlin and urge Chechens to take up arms again. One solution might be for the Russian government to prod Kadyrov’s administration in the direction of greater transparency and developing stronger civic, political and financial institutions by tying future subsidies to performance. An approach in which the carrot is combined with a thickly padded stick applied gently and firmly would be the way to go. Subsidies will only be forthcoming if Kadyrov commits to political, legal and financial reforms and makes efforts to get rid of corrupt practices in his government. An alternative to providing subsidies would be for joint ventures between individual Russian Federation government agencies and private business to invest in particular projects in Chechnya. What active role the Chechen government would have in these ventures would depend on the project itself: the role might be to monitor public reaction to the project as it progresses and make any public displeasure known to the key agents who would then have to rectify the cause. The Chechen government could insist that all ventures must employ Chechen people and provide training for them so that when the projects end, Chechen employees have the skills and experience to set up their own businesses. I do not know if Russia has a hands-off attitude towards the Chechen government’s conduct or already has direct and indirect ways on paper of checking Chechnya’s expenditures and ensuring they are transparent, but just isn’t enforcing its own laws. If the laws exist, Russia might need to appoint a team of auditors to periodically check Chechnya and other subsidy-dependent republics’ accounts, visit the republics to see how government money is being spent and report back to the Kremlin. From what I’ve been able to find out on Google in the way of English-language information about Chechnya’s resources and economy, as of 2003, the republic had a massive environmental problem  as a result of the 1990s wars and the heavy reliance on oil drilling, still the main industry in Chechnya. Petroleum-related air and water pollution was a problem then and could still be a major problem now. Here the Russian government could go some way in making amends for the recent past by undertaking clean-up projects, perhaps together with private firms, and giving Chechens the skills and knowledge of cleaning up their environment and preserving it. There is hydroelectric and geothermal energy potential in Chechnya that could lessen Chechnya’s dependence on imported electricity and provide export earnings. Although Chechnya has oil deposits, many of these are in seismically active areas that would require fracking: a costly venture, and perhaps one the Russian government might prefer not to pursue, given that it already throws so much money at the republic. Chechnya has mineral water resources that could become the basis of a tourist industry centred around spa resorts and related recreation. Mineral water and clays for cosmetic and medical purposes could be exported to the Russian market. Agriculture could be a major export industry as Chechnya has fertile soils including chernozem soils, a climate with warm to hot summers though cold winters and large areas suitable as pasture. Rearing cattle, sheep and horses on steppe and mountain pastures, and growing organic fruit and vegetables for the Russian market would be the mainstay agricultural industries. Beekeeping and exporting honey could also be viable industries if Chechnya is free of varroa mites and other bee colony nasties. A more exotic but possible agricultural industry is raising alpacas for wool: alpacas are mountain animals themselves and would adapt to the highland climate and terrain of the Caucasus; as they have toe nails instead of hooves, their feet are kinder to the soil than sheep’s feet. Together with raising sheep and other wool-bearing animals, related industries such as textiles manufacturing, carpet-making and leather-working could be useful activities that give work to unemployed people, help to maintain Chechen cultural traditions and encourage tourism. Other industries Chechens could consider adopting include adventure tourism (mountain-climbing, extreme winter sports, fishing, horseback-riding, hiking and camping) and alternative energy sources such as wind and solar energy in mountain regions. Farms in remote areas might benefit from opening up to tourists looking for farm stay experiences. It should be mentioned at this point that many industries and ventures suggested here and in the preceding section could be operated either as joint partnerships between government agencies and private interests, or as co-operatives run by communities. The use of Islamic banking would encourage such partnerships with all parties having an interest in seeing projects succeed. Teips could have a role in owning and running industrial and agricultural co-op enterprises that provide jobs for their members and goods for export to the Russian market; in time, profits earned from these enterprises would allow teips to offer benefits such as health insurance, pension funds and credit and mortgage facilities to members. This could go some way to changing popular perceptions of teips as Mafia-type clans. One issue that Russia should be mindful of is the style of Kadyrov’s leadership and what his vision for Chechnya may be. Kadyrov may be re-creating Chechnya in the style of an Islamic emirate with himself as an absolute leader who dispenses largesse to his people and expects their total obedience. Hence, the transformation of Grozny with dazzling skyscrapers, the huge Akhmad Kadyrov Mosque (one of Russia’s largest), an Islamic university and an Islamic medical institute, plus an extensive infrastructure of mosques around the republic . News in the Western media about Kadyrov’s rule – in particular, his apparent disregard for human rights and willingness to harass, arrest and torture those who disagree with him, his attempts to apply Shari’a law (as interpreted by him) and to confine women to the home – could very well be exaggerated but they may also have some basis in fact. The danger in Kadyrov cherry-picking bits and pieces of orthodox Sunni Islam, Sufism and Chechen folk beliefs that suit him and then force-feeding his syncretic Islamic mash-up into his people is that in the long run, Chechens – and younger Chechens especially – will see the patch-up job for what it is, tire of Kadyrov’s approach and either become alienated from Islam altogether (as young people in Iran have done under years of theocratic rule) or start following Salafist / Wahabist Islam. Ironically, this is the form of Islam that Kadyrov wants to combat in Chechnya with his ham-fisted attempts at building an Islamic state. At the very least, popular disillusionment with Kadyrovism, whether in religion or as a bizarre mass social experiment, might express in part in future social problems for Kadyrov’s administration: depression and other mental illnesses, and addiction to narcotics and dangerous drugs, some of which may be supplied deliberately by Western intelligence agencies to undermine Chechnya. There is also the concern of succession: Kadyrov is still young (at this time of writing, he had just turned 35 years of age) and may have consolidated his leadership so that he continues being President for another decade or so. With eight children from his first wife and an apparent stated desire for a second wife, Kadyrov could be planning a family dynasty along similar lines as the Saudi royals. Whether that sits well with Chechen people and their traditions will be another thing; if the heads of the various teips suspect that Kadyrov does indeed intend to pass on the Presidency to his children, that could be the very thing that leads to demonstrations and protests which, if he tries to suppress them violently, will be Kadyrov’s undoing and the cause of his downfall. The Russian government should take care not to associate itself too closely with Kadyrov and to monitor closely his enthusiastic attempts to build an Islamic state. It’s more than likely that the various budget misallocations Russian government auditors regularly complain about are ending up in the various Islamic schools Kadyrov has set up when the money should have been invested in secular education and health care. Russian auditors perhaps need to regularly visit Chechnya pretending to be Muslim pilgrims and tourists to visit mosques and Islamic schools to see how much of the annual budget is being diverted to Kadyrovism! The issue of succession should not wait until Kadyrov starts thinking about celebrating his Silver Jubilee: the Russian government needs to consider cultivating a new generation of politicians with the vision and ideas to reform Chechnya after Kadyrov leaves (or is pushed). To that end, the Kremlin might offer scholarships to young Chechens to study law, engineering, the sciences, the humanities and commerce in Moscow and St Petersburg tertiary institutions with the proviso that the students do practical work during their course-work or for at least two or three years after finishing their degrees in different parts of Russia other than Chechnya. Only then can they return to Chechnya. Regular audits of Kadyrov’s administration as well as his budgets and completion of projects, firm and persistent prodding with the carrot-and-stick approach and other subtle ways of forcing Kadyrov to allocate money to needed projects instead of projects that feed his fantasies are some other options. Although it probably won’t sit well with the Russian public, the fact is that Russia needs to keep feeding Chechnya money as a way of keeping the republic on side and away from Saudi Arabia, Qatar and other oil sheikhdoms flush with money and influence – at least in the short to medium term. Some financial corruption might be a small price to pay for Chechen stability and Kadyrov’s loyalty: how much corruption Russia is prepared to tolerate is for the Kremlin to decide. At some stage Russia will have to loosen the apron strings and force Chechnya to become more self-sufficient and Kadyrov to shelve his dreams of a pure Islamic state. Sooner or later Chechen people themselves will view him as an embarrassment and want him to go. How he should go, when and who or what will fill the job vacancy when he does: for all of this, the Russian government must start planning. If Kadyrov is unwilling to give up his vision of a pure Islamic state, Russia must start identifying future reformist leaders in the republic’s legislature or in other sectors of its society (such as business, primary industries, sciences, culture, the military) and train them. If Russia is clever, these leaders could be cultivated under Kadyrov’s nose in a way such that he would never suspect what was happening; he could be encouraged to approve lists of people for study scholarships, work secondments with private or government employers in other republics or serving junior roles in the Kremlin bureaucracy. Russia will need to forge goodwill with Chechnya if it is to push the republic in the direction of better government and less freeloading: moves to clean up the devastation left by the 1990s wars, rehabilitate Chechnya’s natural resources and find ways of preserving the natural environment for its own sake through ecotourism and adventure tourism ventures and incorporating sustainability principles in all business projects are some possibilities. Where possible, organic and fair trade farming and other agricultural practices should be the norm. Opportunities for Russian advisors and Chechen farmers and peasants to work together and pool their knowledge and resources to improve agricultural methods, find and develop new crops and stock, increase productivity and output, and practice proper stewardship of the land and its resources could open up here. The key is always for Russians and Chechens to treat each other as equals and for both sides to drop their prejudices and stereotypes about each other if they’re to work together to fulfill the goal of making Chechnya a better country. This article was originally written for The Kremlin Stooge at www.marknesop.wordpress.com.